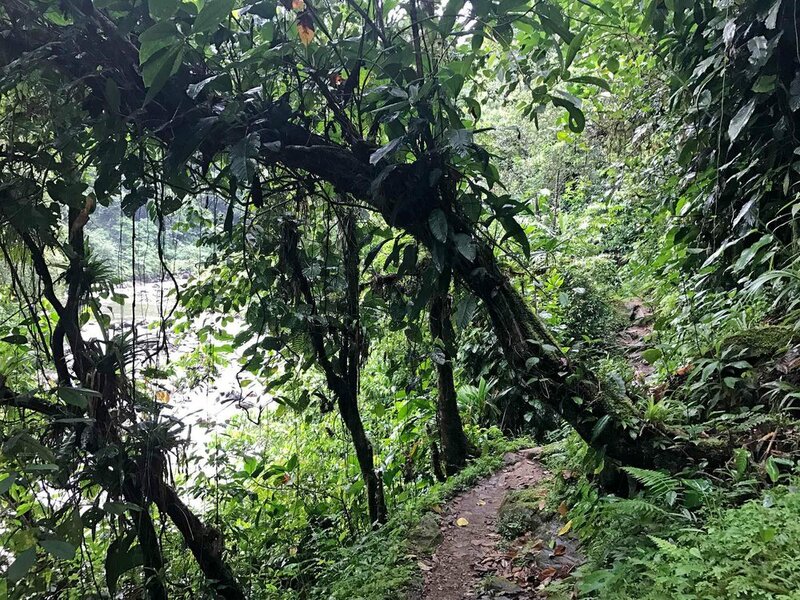 Trekking to the Lost City of Colombia — Sapphire & Elm Travel Co. The Lost City. Like Machu Picchu, but way older. Step back in time by trekking for 4 days in the jungle of Colombia to "Cuidad Perdida". By the time we reached camp on the second day, I was both completely exhausted and ironically energized. A light rain had just started about 15 minutes before we reached the camp, giving a welcome and refreshing relief from the day’s strenuous uphill battle. We arrived at camp in the nick of time as the rain started to pour down on us. The palapa (an open-sided dwelling with a thatched roof made of dried palm leaves) as our only source of protection from the uncertain jungle. I dropped my bag next to my chosen bed, grabbed my eco-friendly soap and headed down the icy river to wash off the layers of dirt, mud, and sweat that I had accumulated over the past 10 hours of hiking through the humid and muddy jungle. Although showers are provided, something about bathing in the river felt more appropriate and connected to this spiritual jungle. I looked around, completely mesmerized of where I was, what I had seen over the last two days, and what I knew I was about to discover. Deep in the heart of the Sierra Nevada mountains in Colombia, was a storied community now abandoned, now known as Cuidad Perdida – Spanish for the Lost City. We started the hike on a Wednesday afternoon. The one-hour drive from the entrance of the park to the pueblito at the base of the trek felt like an adventure in and of itself; we bounced gleefully gazing at the jungle and waterfalls. At one point a tree was completely blocking the road and we had to move it, another point a pop-up river was so deep that the driver looked at it with worried eyes as we cautiously drove through. All the while palm trees and waterfalls were always in sight. It’s one of those car rides where the bumps only add to the gleeful experience. The first day of the trek is short, only 4-4.5 hours, although it’s a steady gradual incline. At times I secretly hoped for flat ground, but mostly I was too focused on the surroundings that I wasn’t thinking about anything else except for how shockingly spectacular these views were. At the day’s peak, we were greeted with fresh, delicious coffee from the family living there. There were a few broken benches you could rest on for a moment, just careful not to put too much weight on any of the compromised parts! It seemed like the tough part was behind us since we had completed the days ascend. Not quite. What followed were muddy trenches offering ample opportunity to fall or get your shoe stuck in the mud, thus covering your show in the thick, reddish goo. The only thing to do – laugh it off and wait for a river to walk through to clean your socks and shoes (which there were plenty). TRAVELERS TIP: Rainy season is October to December, although there are light rains year round. Camp was a welcomed destination, reminiscent of youth where strangers become friends through shared activities and experiences. At long picnic tables, we ate a wonderfully prepared meal and chatted about the days hike, what was to come, and tales from our past journeys. Day 2 began at 5:30 in the morning with a prompt breakfast and early start to the hike. We had a lot of ground to cover this day; 13.9 km (8.7 miles) and 10 hours in total. Surrounded by lush jungle, the first half of the day was a walk in the park – literally. We mostly climbed the mountain and descended again at intervals so brief or gentle it was hardly strenuous - although a few times I did find myself wondering dreadfully, “how much more can this part go up"? Thankfully the views were possibly even more spectacular than the first day. At most of the resting spots, there was an opportunity to buy fresh squeezed orange juice, cocoa beans, bananas, or indigenous jewelry – so bring cash with you. Our stop for lunch couldn’t have been at a better location. It was a campground next to the river, equipped with bathrooms, showers, benches, and clotheslines. It’s actually where we would stop again to camp at the end of the third day. When we stopped around 10:30 for lunch we had about an hour before we would eat, meaning plenty of time to go for a swim! After hiking in the same outfit the first two days (as was recommended to me by the guides so I could avoid carrying around wet, heavy clothes), I went in the water in all of my hiking clothes – shorts, tank, sports bra knowing I’d have time for it to dry before embarking again on the hike. It was so refreshing. After lunch is when the real difficulty began. A steady, steep, muddy incline for over two hours. This might not sound too terrible, but I tell you what, the grade of incline was steep enough I was often using my hands for help. It’s the kind of hill where talking is out of the question and you shouldn’t waste your energy or breath – and if you’re walking with someone and they have to stop, you can’t stop with them for fear you might not be able to pick up again. You get the idea, it was tough. Fast forward to the mountain’s peak where pineapple and oranges were awaiting us, followed by another 2.5-3 hour walk (mostly decline or flat) in the woods. Stunning woods, rivers, waterfalls, wild pigs, and so much more await you here. Which leads me to where our story began; post bath in the river in the rain, again with all of my clothes on. Dinner of the usual suspects – rice, vegetables, soup, and meat, or beans for the vegetarians like me, with tea, coffee, and juice followed by a candy bar for dessert. Trust that you will be fed a lot on this trek. I, along with many of my companions, brought snacks of bars, bananas, crackers, even cans of tuna. We needed none of them. Plus, at most of the camps, they have little tiendas where you can buy a soda, Gatorade or a snack if your craving something. Traveler's Tip: it is so important to stay hydrated on this trek! I filled up my liter water bottle at every stop (3x during the day, not including what I drank at the overnight camps) and it still didn’t feel like enough. I felt light headed from time to time and my fingers were swelling. Luckily I remembered I had hydration tablets with me, so I added those to my water at the stops and it made all the difference! We awoke to day 3 similarly to the day prior, 5:30 am wake up call and prompt breakfast before starting the day’s hike. Quickly we crossed a powerfully flowing river that would wake up even the worst morning person and climbed 1,200 ancient stone steps before entering Cuidad Perdida, the Lost City. Climbing the 1,200 ancient stone steps was easier than it seemed. Although the stone steps were narrow and slippery, it took only 20-25 minutes to climb all the steps. The Lost City, also known by the indigenous name of Teyuna, was built around 700CE - roughly 750 years earlier than Machu Picchu, by the Taironas and inhabited until the year 1700CE. After the arrival of the Spanish, the indigenous peoples fled to the city of Teyuna in the highlands once again for protection from the new threat. Deep in the jungle, the Taironas had mother earth on their side for they knew the lands, the weather, the trees and the Spanish did not. It is said the Spanish never reached the city, but still the Taironas were dying from diseases brought by the Spaniards. In 1973, Teyuna was discovered by the Sepulveda family who sacked the area for years for the gold and precious stones that were found in the tombs of the Taironas. Soon others joined in the raiding, even killing the father of the Sepulveda family until 1982 when there was nothing left. The Lost City was one of the largest pre-Columbian towns discovered in the Americas. Since the Kogi use primarily plant life for their shelter ancient dwellings aren’t still standing, however, the rings where they used as a base for the huts are there. In fact, one Kogi family still live there today. You can see them farming or children playing as you walk through. During the hike you have the unique opportunity to talk to one of the local tribe leaders about their traditions, cultures and beliefs. One belief in particular really resonated with me. The Kogi's believe in the profound connection with Mother Earth, they will not take from the Earth without asking permission and giving something to Earth in exchange. They believe that the world is in peril, life and resources threatened, because humanity has lost sight of the integral connection between people and Mother Earth. 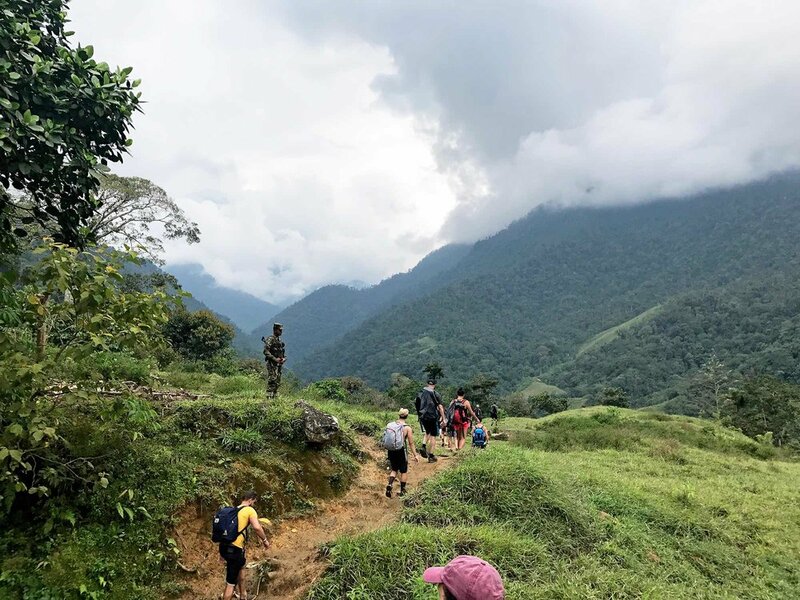 Every aspect of the trek to the Lost City was a beautiful and eye-opening experience, from meeting wonderful new people to discussing philosophy to sleeping in the jungle. In order to reach the Lost City, you’ll hike a total of 29 miles (46.6 km). Most people hike to Cuidad Perdida in four days - and 72 hours since you start around 1pm on the first day and finish around 1pm on the last day. This hike is quite demanding, and therefore to complete it you should be fit. If you question if you are capable of completing the hike in four days, you can choose a 5-day or 6-day hike. It’s the same path and the same total distance, you would just be walking less each day. Tours depart daily from Santa Marta, however if you’re staying elsewhere tour agencies can accommodate. We personally recommend working with Magic Tours for their intimate group sizes and above and beyond service. Cost is 950,000 COP (roughly $350 USD). This is for every tour agency, and is non-negotionable. Bug repellent, for both mosquitos and sand flies! Check the repellent you have to ensure it works for both, I got bit by mostly sand flies! Personal toiletries – toothbrush and paste, brush/comb, etc. Every camp has showers, toilets, and sinks for you to wash up and get ready. Small First Aid Kit – Band-Aids, blister protection, Imodium, hydration tablets, etc. You can hike year round except September, as there is a month long closure as in order to maintain the site and for spiritual practices of the indigenous tribes in which the Koguis and the Arsarios - also known as Wiwas, gather every year for a “spiritual cleansing” of the territory. This kind of sacred ritual no one, absolutely no one, who is not from their community can enter, because if they do, the spiritual connection would be interrupted and the cleaning would be damaged. Dry season is January to March, which means less mud and easier river crossings. However, this also means it will be a lot more crowded. One of the incredible things about Cuidad Perdida is that there are very few people here. When I was at the site, there was less than 100 people there! I hiked Cuidad Perdida in November during rainy season. It was quite muddy and it rained every night but luckily it didn’t pour on us at any point during the daily hikes. In my experience Colombian rain happens in the late afternoon, evening and night. The Lost City trek is a medium to difficult level hike. It does not require special equipment or ability like rock climbing. Nor does it require you prepare ahead of time. If you are active, in good physical condition, and can walk up and down hills or mountains without hurting knees, then you will be fine. Can hike 14km in one da (although 5 and 6 day tour options require much less distance in one day). It's also worth noting that you can have a porter or mule carry your pack. Sapphire & Elm Travel Co. is unique in that we know first hand the experiences that you want to do. We pride ourselves on having been to the country, and that we don’t plan our clients’ vacations based on vague, outdated or incomplete internet searches, but on personal experience and knowledge. By traveling to the country ahead of our clients we are able to research and gather insight into the cities, activities, hotels, transportation and more in order to save our clients precious time, energy, money and hassle while you’re abroad, and improve your experience. Contact us to plan your one-of-a-kind vacation to Colombia.